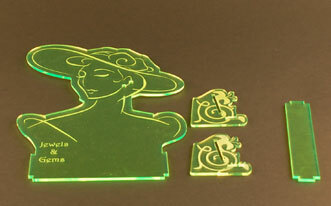 Acrylic is a very popular engraving material because of its versatility and durability. 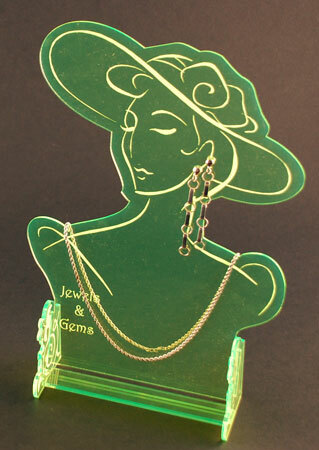 This brightly colored acrylic jewelry display piece is a fun and easy project that shows off popular jewelry items. One 12-inch by 12-inch piece of acrylic, 1/8 of an inch thick. We used a 45-watt Helix with the following settings: 45% speed, 100% power for engraving and 6% speed, 100% power, 5000 frequency for cutting. This sample club project begins by placing the vector pin table in the upper left corner of your engraving system. Then place the piece of acrylic on top of the pin table as pictured to the right. Open the file and personalize as necessary. Since we're engraving from the back, remember to mirror any text you include so it reads correctly from the front. The file has been set up to first engrave and then cut. We used the color mapping feature to dictate the order of the cutting. 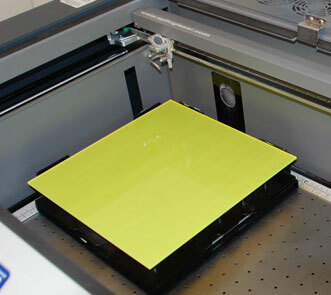 You'll want to refer to your owner's manual to determine the recommended speed and power settings for acrylic. After you determine the settings for your machine, send the job to the laser. When you're finished, you'll have four pieces to put together that make up the display. Insert the base into the two slots on each side piece and then secure the main piece in the center - insert jewelry and you're done.